Transformational Tracking & Guiding, commonly known as Trans-Track, is a capability included in SA Ultimate that allows you to take full advantage of multiple instruments and use them to provide real-time position updates. Using a live 6D position update allows you to easily monitor the motion, location, and relative orientation of two objects. 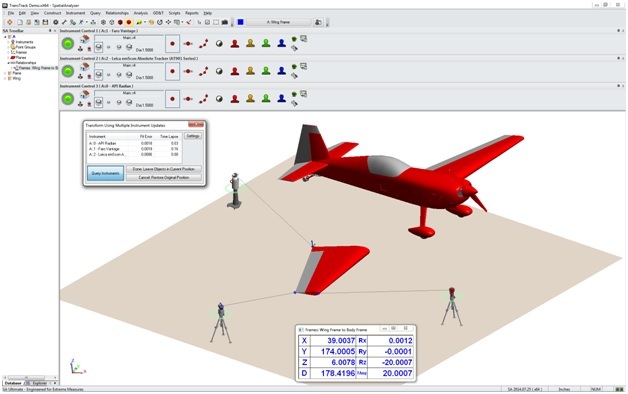 Trans-Track opens the door to endless real-time alignment possibilities such as aligning a wing on an airplane or a demo part with the edge of a table top. The tips below will help you streamline the setup and application of a Trans-Track alignment operation in SA. Add, connect, and co-locate any instrument(s) you want to use in the measurement process. Measure the current “starting” location of the part that will move. 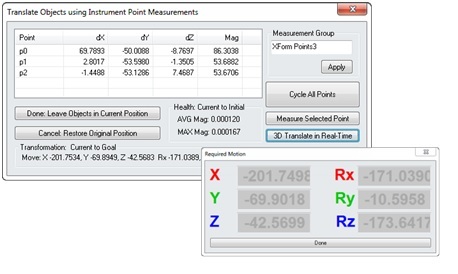 Create or measure a destination frame and add a 6D watch window to display the real-time displacement to the goal. Begin the measurement operation, measuring the “monitored” point(s) on the part as it moves though 3D space. Establish the position of points to monitor (measure three or more locations on the part). Measure or construct the location of a destination “goal” group (point locations corresponding to the monitored points on the part in the desired final location). Begin the Trans-Track Operation (Edit>Move Objects>Guide Objects in 6D Using Point Measurements). The Translate Objects using Instrument Point Measurements dialog provides many of the same controls used regularly in either a measure nominals routine or a drift check operation. It allows you to measure a single point or cycle through all the points in the list and compare their current location to their previous location. The 3D Translate in Real-Time button opens an additional realm of possibilities. This allows you to select a point to monitor in real-time and then provides 3D translation updates as the part moves, as long as the operation runs. As soon as the part stops, you can press the stop button and SA will automatically remeasure all of the points for you and update the part position and orientation. This option allows you to move and reorient your part until you reach an ideal alignment in a sequential iterative alignment process. With three or more instruments connected simultaneously within SA, the position of three targets can be monitored in real-time on an object to establish its position and orientation. This can provide accurate alignment information for large objects because location points can be widely spaced. Also, this can nearly eliminate angular resolution errors resulting from measurements of a single 6D target. 1. Add, connect, and align the three instruments. The first step of a Trans-Track operation is to prepare the instruments. All instruments must be connected and aligned within the job file in order to use their measurement data simultaneously. First, lay out a set of nominal control points visible from all the trackers and align all three trackers to those control points using an USMN network alignment (for more information on USMN, refer to the Basic USMN tutorial in the user manual). 2. Spatially locate the moving part within the job file. The starting position and orientation of the part that will be monitored must also be established within the job file. This should be a fixed location that can be measured from any one of the trackers. 3. 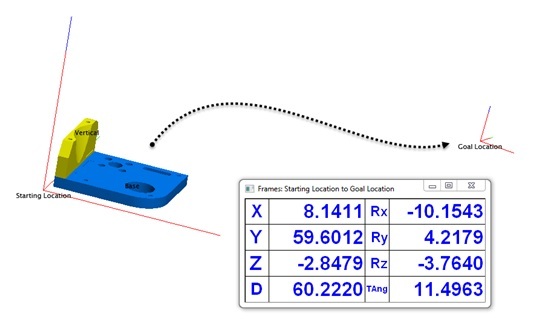 Designate a goal location for the moving part to reach and build a 6D watch window. Typically, a Trans-Track operation is intended to provide real-time alignment information between a moving part and a destination for that part. In order to clearly identify the relative position changes, a frame should be built on the moving part and at the intended final location. A frame to frame relationship can then be built between these two frames and a 6D watch window added to this relationship to display the relative positional and rotational deviation between those two frames. 4. Establish the points to monitor during the move process. Each tracker needs to monitor a single reflector that is attached to the part while it moves. The best way to do this is to glue a set of pucks onto the part so that you ensure the reflectors do not move relative to the part. Next, measure each starting location. 5. Begin the measurement part alignment process. Select Edit>Move Objects>Transform in 6D Using Multiple Instrument Updates. Select each of the instruments to use, followed by the starting points that were measured on the part for each tracker. They need to be selected in order to pair the instrument with the points (Inst1, Inst2, Inst3, Inst1-point, Inst2-point, Inst3-point). Select Query Instruments to begin the live measurement process. The transformation dialog will display the fit error and the time lapse between the measurements. A fit tolerance can be applied to disregard out-of-tolerance conditions. The time lapse tolerance also notifies you of potential communication issues with the instrument network. Locate the instrument in the job (file as needed). Measure or construct a destination “goal” frame. Rigidly attach the 6D probe to the moving part and measure its current location. Add a 6D watch window by building a frame to frame relationship. Begin the Trans-Track operation (Edit>Move Objects>Transform in 6D Using Instrument Updates). Photogrammetry systems also return 6D measurement information through simultaneous measurement of a collection of targets. The same procedure can be used to perform a Trans-Track operation with a photogrammetry system using the command Edit>Move Objects>Transform in 6D Using a Batch of Points from an Instrument. In conclusion, Trans-Track allows you to take full advantage of as many instruments as are available to you and use them to provide real-time position updates. Trans-Track gives you the ability to monitor the motion, location, and relative orientation of two objects and ultimately provides endless real-time alignment possibilities.